Microcirculation is the generic name for the finest level of the circulatory system and consists of arteriolar and venular networks located upstream and downstream of capillaries, respectively. Anatomically arterioles are surrounded by a monolayer of spindle-shaped smooth muscle cells (myocytes), while terminal branches of precapillary arterioles, capillaries and all sections of postcapillary venules are surrounded by a monolayer of morphologically different perivascular cells (pericytes). Pericytes are essential components of the microvascular vessel wall. Wrapped around endothelial cells, they occupy a strategic position at the interface between the circulating blood and the interstitial space. There are physiological differences in the responses of pericytes and myocytes to vasoactive molecules, which suggest that these two types of vascular cells could have different functional roles in the regulation of local blood flow within the same microvascular bed. 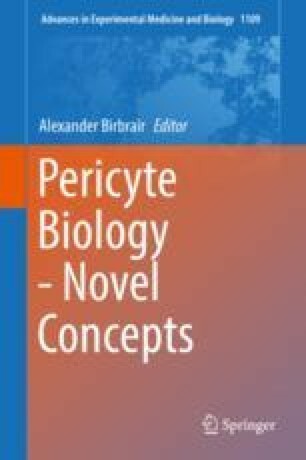 Also, pericytes may play different roles in different microcirculatory beds to meet the characteristics of individual organs. Contractile activity of pericytes and myocytes is controlled by changes of cytosolic free Ca2+concentration. In this chapter, we attempt to summarize the results in the field of Ca2+ signalling in pericytes especially in light of their contractile roles in different tissues and organs. We investigate the literature and describe our results regarding sources of Ca2+, relative importance and mechanisms of Ca2+ release and Ca2+ entry in control of the spatio-temporal characteristics of the Ca2+ signals in pericytes, where possible Ca2+ signalling and contractile responses in pericytes are compared to those of myocytes.